Panforte di Siena | Just Visit Siena ! Panforte di Siena one more time . . . But now you can try to . . . prepare it ! Because again by the courtesy of Giulia Scarpaleggia (http://en.julskitchen.com/) you can get the original recipe for Panforte di Siena and enjoy its unique taste. The link to recipe you can find below . . .
Do you remember Ricciarelli di Siena? I hope so! 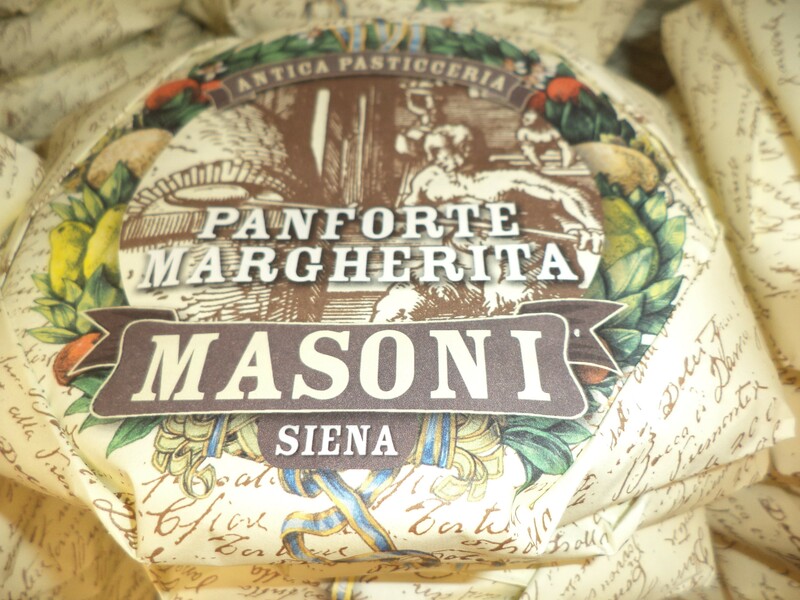 Today let me introduce you another delicacy, frankly speaking my favorite-Panforte di Siena. Trust me without it you shouldn’t leave Siena. Also the most popular in Christmas time but available throughout the year. So don’t worry you can taste it and get it here when you want! As I mentioned it is for me (next to chocolate) the best sweetness. That is why maybe I’m not objective but it is not a big deal for you I guess!? Panforte is called as a traditional Italian dessert that contains fruits (for example candied orange and cedro peel) and nuts (mostly my almonds). It is derived of course from Siena. Can you imagine that from 13th century. It is like tasting history! What is more ‘’(…)documents from 1205 show that panforte was paid to the monks and nuns of a local monastery as a tax or tithe which was due on the seventh of February that year(…)’’(http://en.wikipedia.org/wiki/Panforte). Panforte (literally “strong bread”) has very characteristic look – thick and dense cake. And it seems hard to prepare. But as everything to eat in Italy it is simple to make (fortunately)! Thus sugar is melted in honey and various nuts, fruits and spices are mixed together with flour. This everything is then baked in a flat pan. So easy, isn’t it? The taste is for me unique and totally priceless. . . For sure the most impact have spices and perfect quantity of ingredients. In Siena it is sometimes said that Panforte has to have seventeen different ingredients that reflects the number of Contrade. 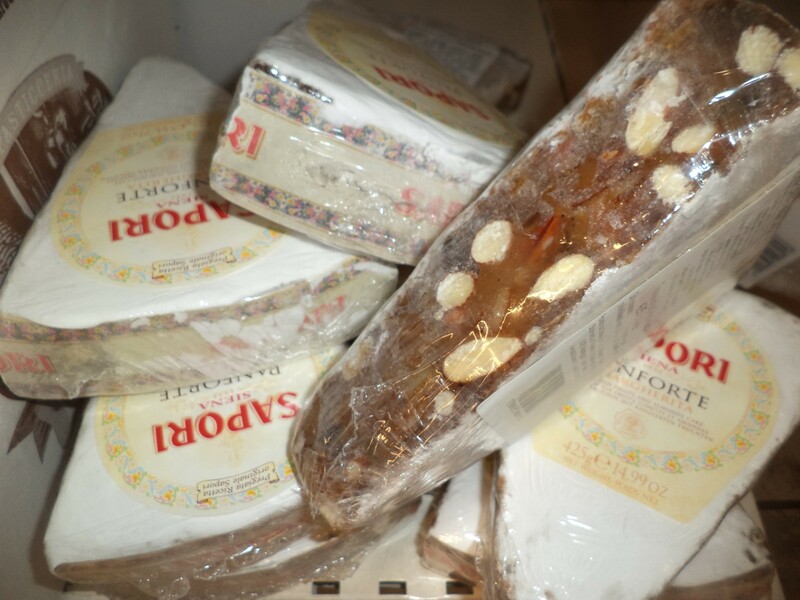 Here as you will for sure notice our Panforte occurs in a variety of sizes, tastes and wrappings. That is why price is different. But certainly it is not a cheap tidbit! But as you can guess for sure it is worth its price! What is more you shouldn’t even consider how much you have to pay ! Then you can enjoy the uncommon taste with for example cup of coffee or glass of wine! And certainly not only during the Christmas that is so close!